Dear Food Geek, I have a bunch of spare oranges and would like to use them up in a salad. I want something a bit different too. Any ideas? 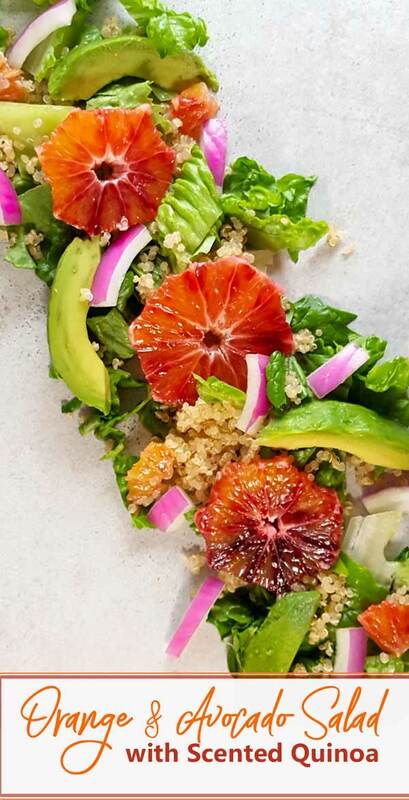 When it comes to winter salads, oranges deserve a spotlight, so let’s give them one! 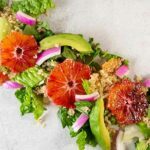 I have an option that I hope you like – the treatment of the quinoa is key to making this a little bit different than a regular every-day salad. The quinoa is cooked in freshly-squeezed orange juice and a favorite spice of your choosing. I like rosemary or cinnamon best with oranges, but you could go crazy and try mint or cloves or the list goes on. While we’re at it, let’s make sure to use all parts of the orange. Some zest and a little more juice make their way into a simple vinaigrette. And of course, sliced or segmented oranges are tossed in the salad as well. 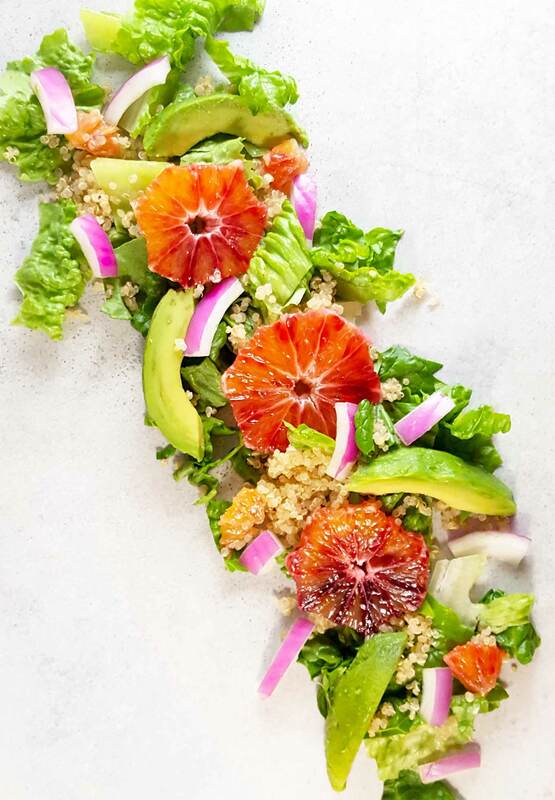 Oranges get the spotlight in this salad with avocados and quinoa. Squeeze 2 oranges into a measuring cup, add water until you get 1 full cup. Add to a pan with quinoa. Toss in 1 rosemary sprig, or a pinch (or two) of your favorite spice. Bring to a boil then simmer for 10 minutes. Turn off heat and let set for 5 more minutes, until tender. Fluff with a fork. **Read cooking directions on your package in case it needs to cook longer or shorter. While the quinoa cooks, zest one of the oranges and then squeeze the juice into the measuring cup. Add honey and whisk in oil. Add salt to taste. Slice onions, avocados and last remaining orange. Put salad greens in a bowl and toss with 1/2 of dressing to get them evenly coated. 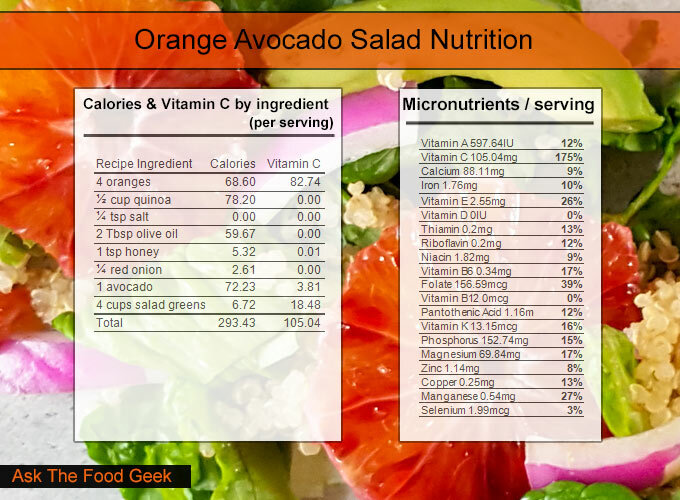 Add quinoa, onions, avocados and oranges to the bowl. Top with remaining dressing. To make this a full meal, either double the whole recipe, or just the quinoa and avocados. How to peel and slice an avocado: Cut the avocado in half and twist away from the pit. Then cut each half again to get 4 total wedges. Use your fingers to peel the skin off from each wedge (pictures). How to segment an orange: The Pioneer woman has a nice picture tutorial to follow.Cut the top and bottom off the orange. Set it on a cutting board and cut the peel away in strokes from the top to bottom. Then holding the orange in your hand, cut between the membranes to get the segments out. Seasonality: Oranges are available year round. Valencia oranges are available in spring and summer, with blood oranges and mandarins available in fall and winter (source, whole foods). Avocados are also available year-round. While this salad tends to find a home in the wintertime, it can be made year-round. 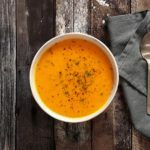 Onions: when I use rosemary, I like the red onion in this recipe. However when using a subtler herb or spice, I’d suggest either a shallot or green onions, as a red onion might overpower it. There are a lot of orange and avocado salad recipes, but most of them left me wanted a little bit more. After making a Moroccan chicken stew that cooks quinoa in orange juice with some cinnamon, I realized that would be perfect for a salad too.